Iréne Theorin (Turandot), Simone Frediani (Calaf), Renata Vari (Liù), Sorin Drăniceanu (Timur), Ioan Cherata (Ping), Cristian Bălășescu (Pang), Bogdan Olaru (Pong), Mircea Tudora (Altoum), Dragoș Drăniceanu (un Mandarin). Iréne Theorin will be Turandot in Craiova, the news simply struck me. Opera Craiova was going even further, with the name of the tenor, Ian Storey, it was already too beautiful to be true, and any question was useless. Such a thing just had to be seen. Meanwhile, Storey catches a cold and cancels. At the last moment, he is replaced by this Simone Frediani, tenor with a very recent career, and everything seems to become a roulette, where the bet was nothing else but Puccini’s music. Yes, Puccini’s music, from his last, unfinished, so atypical creation. The one who composed operas about ordinary people and their dramas, so close to our own daily dramas, the one who avoided heroism but never forgot to give credit to nobility, Puccini gives up his profession of faith and just gives in to the music of great masses, of mythological topics with princes and princesses, of empires that fall and heroes that rise. E poi, Tristano are his last words on the unfinished scores, his admiration for Wagner is extremely visible. 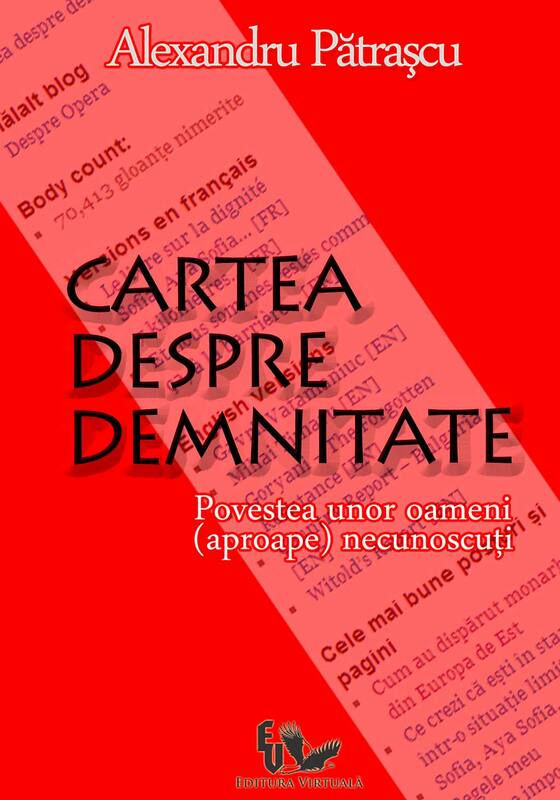 It is difficult to avoid looking for a link between the sequences of the first act and the real life, the anti-corruption protests all around Romania, when you listen to the music of the people gathered in the night and empathising with the victims of the ice princess who sentences to death the pretenders not able to solve the enigmas. People who then jubilate when they see the blood. It is difficult not to make a parallel between the cynical (or wise?) comments of Ping, Pang and Pong and the comments we see in the media nowadays. Looking from this perspective, I think that Puccini is not so difficult to understand with his Turandot. It’s again about us. It is not the best time to extensively discuss Emil Strugaru’s production, (inevitably) classical and derisory-reductionist as scenography, but with competent lightning and coherent scene movement, without aiming at producing a revolution. This production has been a vehicle for opera singers of different calibers, and last night, more than ever, it served good voices. 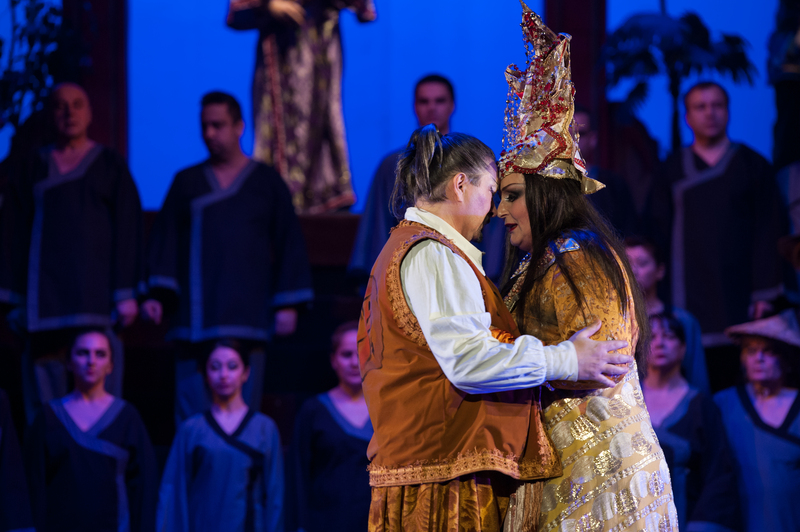 The first act was dominated by praiseworthy efforts, not always successful, that raised the tension of waiting for Iréne Theorin, as Turandot starts to sing in the second part of the opera. 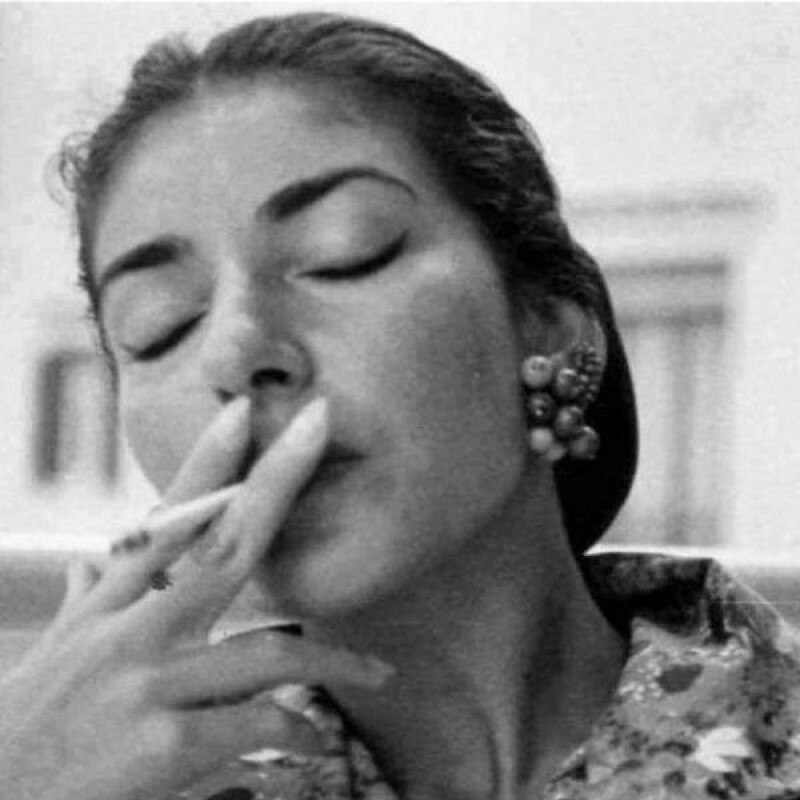 The soprano’s authority seemed to be felt on stage long before her first notes, as Renata Vari was a stressed Liù, with large and dramatic vibrato, instead of a lyrical and vulnerable one. Sorin Drăniceanu also seemed uncomfortable in Timur’s tessitura, who was suddenly too high for the well-known bass from Craiova. As for Calaf, Simone Frediani was already showing the assets of a virile voice, doubled by a timbre unexpectedly rich, with lyrical accents, but with some passage problems, that made me keep my fingers crossed for him for the confrontation in act II. Iréne Theorin started to sing In questa reggia and from here on everything was different. Epic, I would say, something to talk about not only after the performance, but even next year. 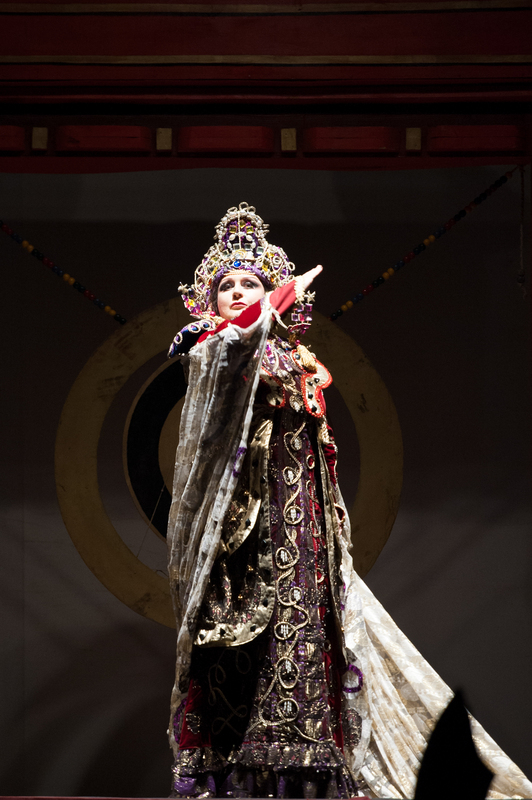 In 2009, when she was debuting in Andrei Șerban’s production at the Royal Opera House, the critic from Opera wrote she is the best Turandot since Gwyneth Jones (in 1984). I saw her at the ROH in 2013, and the impression she made was very strong. Last night she was as I had known her, nothing had changed. This ice princess cuts with her voice not only through any orchestra (and even more through the orchestra with 40 people, in Craiova), but, however high she goes with the aria, her timbre stays voluptuous and produces not only force, but also a personality that arrests the audience. Theorin is a soprano who manages to give roundness to a role that modernity can make impenetrable and schematic. Theorin manages to always give credibility to the end of the opera, when the ice princess turns into a princess in love. She is not only a wagnerian and superhuman voice landed in an Italian opera, she is also a mixture of force and femininity. In act II, Frediani coped with her with a bravery to remember, and then he delivered Nessun forma without any emotions, getting to the finish as a winner. This tenor just started his career a few years ago, and already jumped in the dramatic repertoire: he learned how to sing Luigi, from Il tabarro, by listening to the recordings with Vasile Moldoveanu, and he is confirming the research about dramatic spinto voices that explode late, but decisively. As for the rest, all those on stage did their best to sing as well as they could. The orchestra managed to play well generally (all the brass successfully avoided the mistakes and, for once, I heard the horns playing correctly), even though the sections never started or finished together. Walter Attanasi showed more flexibility than in Don Carlo and managed to support the dramaturgy, even though the attacks were soft and his Italian manner of conducting pushed to the back the modernity of the instrumental score and cancelled the explosion. In the same area we could find the chorus and the three ministers, who sang with aplomb, but unequally and without refinement, but better than an unsure and below the tone Altoum, or a rather shy Mandarin. Is it possible, today, for a great soprano to produce an emulation like in the ‘60s, when Virginia Zeani came to sing in an isolated Romania? Of course it is, but one night is not enough. E poi, Tristano – there are rumours in Craiova about a Wagner concert, this autumn, with Theorin and Storey, and then… and then only time will tell. 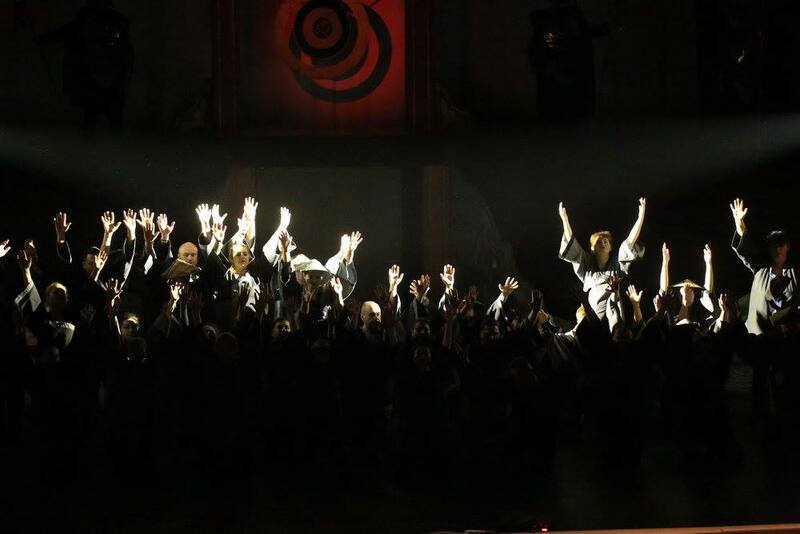 For now, we cherish this moment, when the princess Turandot effortlessly flew over the chorus and orchestra, just to set the stage and that February night on fire.